After seeing an nth poster about raising awareness, I thought to myself… Could one succeed in rising the level of awareness by sharpening one’s perception rather than repeating the vapid catchphrase, “raising awareness,” which has been coopted by an ever-growing money-raising industry that fails to improve our circumstances in a substantive way? 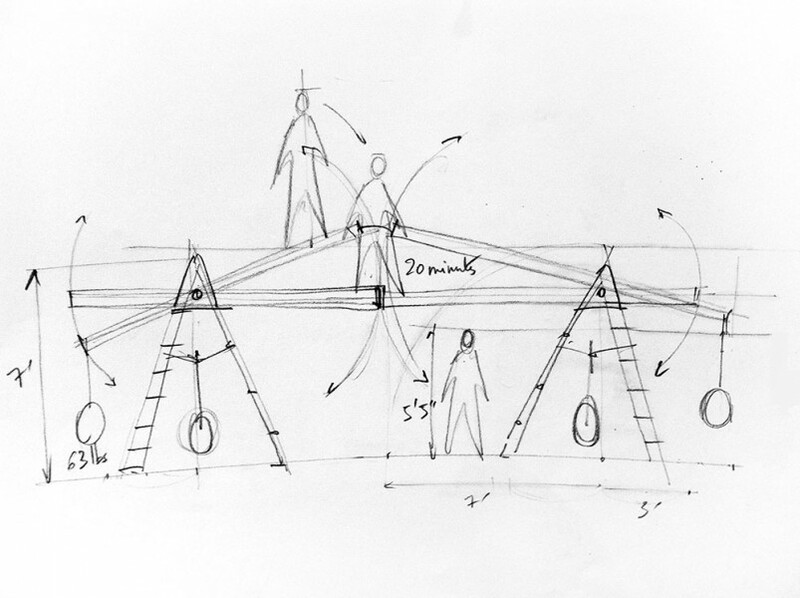 Wearing a cocktail dress, I will assemble a twenty-foot wide kinetic structure in front of the audience, then silently climb on the ladders and walk over the two pivoting wooden beams attached at seven feet off the floor. I will remain balanced at the juncture of the two beams for about 20 minutes, stabilizing myself in space with the help of two counterweights (see sketch below). Rising Awareness addresses my ongoing preoccupations and observations about the physicality of experience, inhabiting the body, proprioception as the possible strongest sense of self, how spatial awareness correlates with overall awareness and self-awareness, how physicality enhances creativity, finding balance between gravity and groundlessness, a concept of happiness as the fullest expression of one’s particular cognitive potential, pushing boundaries, and the current irreverent politics of liability. 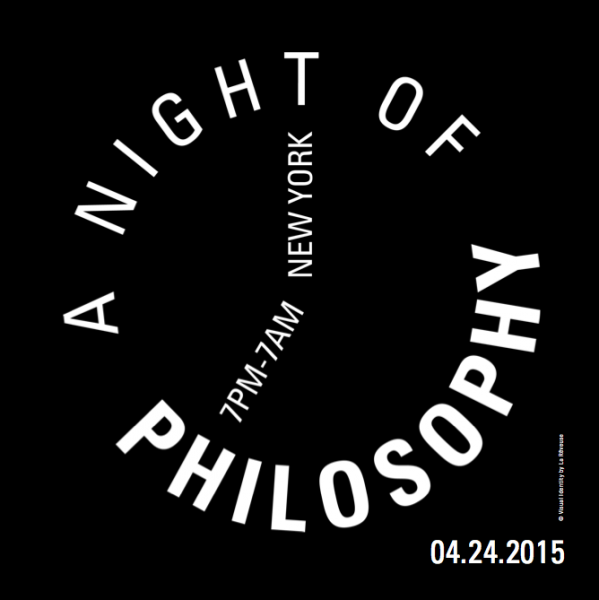 It is the first incarnation of The Night of Philosophy in New York, after four successful instances in London, Berlin and Paris, showcasing contemporary philosophical thoughts in a non-academic setting. 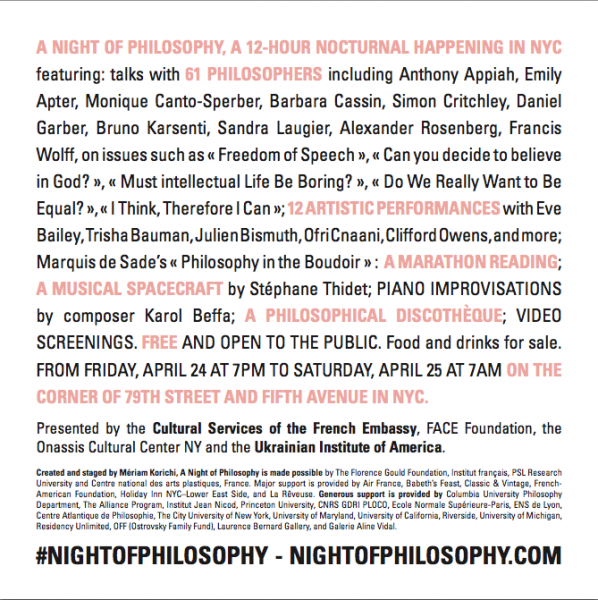 Over the course of the night (7 pm April 24 until 7 am the next day) there will be talks by 60 international philosophers, 12 art performances, ongoing film screenings and music, running concurrently at both the French Cultural Services and the Ukrainian Institute of America. I will be there to hear all twelve hours ring (a performance in its own right!). Hope you can join me starting at 8:50 pm and maybe stick around for what promises to be a memorable event! Oh, and I almost forgot: it’s free!